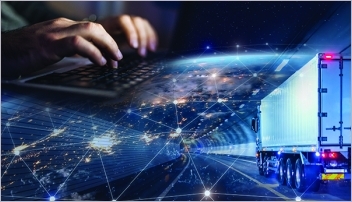 In a marketplace that’s seeing a slew of new entrants and significant technological advances, the truckload brokerage market finds shippers and carriers alike seeking out the highest visibility and the best value in a fiercely competitive environment. Even though the U.S. GDP remains stagnant and retail sales continue to plod along, it hasn’t had much of an effect on the ever-expanding truckload brokerage market. At a time when capacity remains readily available and shippers aren’t scrambling for loads, the market is brimming with new entrants vying to make a name for themselves. At the same time, established, well-capitalized players are on a mission to create more market separation from their biggest competitors and newbies alike. Regardless of size of the brokerage and market conditions, one common tune all brokerages are playing centers on leveraging technology as a key competitive advantage and differentiator. Nearly all brokerages are now showcasing their tech prowess as a true value-add in order to stay ahead of the competition, whether it comes through the “Uberization” of truckload brokerage or API’s that bring together load and rate information in seconds. Logistics Management (LM): How would you best describe the current state of the truckload brokerage market? John Larkin: We’re currently in no man’s land, wherein shippers want rate concessions and carriers are looking for higher rates. This confluence of events puts the squeeze on broker’s margins in the truckload space. At the same time, we would say that less-than-truckload (LTL) brokerage is more stable on the pricing and cost fronts and margins remain solid. Ben Hartford: From my perspective, the overall state of the truckload brokerage market appears balanced at present. After 2014’s capacity tightness and resulting spike in spot truckload rates, 2015 was marked by incremental capacity growth coupled with weakening industrial end-market demand. This resulted in excess capacity in 2016. This year has been relatively stable to date, following the volatility of the past three years. 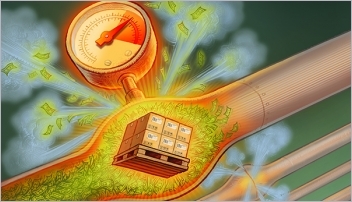 Amid the cyclical dynamics, the truckload brokerage market is also on the cusp of what appears to be as much transformation as the market has faced since at least the mid-1990s, when the initial wave of “logistics outsourcing” first began in earnest. Evan Armstrong: I’ll add that the state of the U.S. third-party logistics domestic transportation management (DTM) market segment, which includes freight brokerage and managed transportation, is good. We’re seeing a continuation of 2016, which had the 3PL segment net revenue growth of 7%. The DTM market segment had gross revenue of $61.8 billion and net revenue of $10.2 billing in 2016. In the meantime, there’s ample truckload capacity in the market, so shippers are covering some transportation needs themselves versus using brokers. However, average gross margins are still solid and are running at 16.5%, so smart 3PLs are focusing on how to cross-sell truckload brokerage into LTL and intermodal, as well as other value-added services. LM: What is driving growth in the market? Hartford: We believe that growth in the truckload brokerage market and logistics in general is being driven by three primary elements. First, outsourcing of logistics functions continues, with small and medium-sized customers the most likely sources of sustained outsourcing and subsequent growth in logistics-related functions. Second, the dynamism of the past few years continues to underscore the challenges facing in-house transportation managers and the value provided by truckload brokers that provide both scale and visibility to the supply chain. Third, and in a similar vein, the demand for visibility among shippers—which we understand to outpace shipper demand for both lower price and faster transit/cycle times by a factor of two or more—can increasingly be facilitated by new technologies and support sustained growth in the U.S. domestic transportation management market 2x to 3x greater than underlying U.S. GDP growth. Armstrong: And with ample TL capacity available, DTMs are looking to expand into more value-added services. These include converting LTL shipments to truckload using transportation management systems (TMS) to support transportation planning, building static (daily/weekly) multi-stop truckloads, or looking at pool distribution strategies. For 3PLs with integrated transportation management and value-added warehousing operations, cross-selling integrated solutions is a focus. This is also an emphasis for air and ocean freight forwarders with domestic transportation management networks. Armstrong: We continue to see increased process automation via utilization of the data available through the Internet, or with specific application programming interfaces. The ability for DTMs to access real-time shipment track and trace information, rate quotes, and carrier capacity information is reducing the need for manual data entry and follow up with carriers. In addition to traditional EDI data interfaces, many DTMs are using , Kofax, Kapow and links to electronic logging device (ELD) data to drive improved data integrations and process automation. Larkin: The first would be the emergence of mega-3PLs like TQL, Coyote and Echo that are challenging C. H. Robinson to work harder to stay in the lead with respect to technology, scale and breadth of services. The willingness of LTLs to embrace partnerships with 3PLs has also been a healthy development that has helped leading LTL carriers access smaller customers, open new territories and move in the direction of dynamic pricing. Hartford: With that said, we view the biggest change in the market over the last five years to be the proliferation of and interest from new entrants in the domestic U.S. brokerage space. This interest and resulting increase in competitiveness, coupled with the relatively balanced supply demand environment since 2011, has led to compression in per-unit gross profit margins for truckload brokerage transactions in high-density lanes on the margin. The biggest advancement is arguably being undertaken at the moment, with the transition to platforms utilizing APIs. APIs provide real-time transmission of data and result in tools that offer increasingly “real time” visibility to shippers into their individual transactions and supply chains broadly—as opposed to the more static platforms that were facilitated through EDI. This migration toward API-based platforms should improve visibility to shippers, and we believe brokers with scale that have committed capital to develop integrated platforms will be in a position to absorb share and consolidate the still highly-fragmented U.S. domestic transportation management market. Larkin: Truckload brokers initially benefitted from the loose supply and demand experienced in late 2015 and early 2016. Purchased transportation costs dropped and only a portion of the savings were passed along to shippers. The shippers then smartened up right about the time the spot market began to firm—they wanted lower prices while carriers wanted higher rates, thereby squeezing broker margins. Brokers are hopeful that a recovering economy, smaller fleets and the impending ELD mandate will tighten supply and demand sufficiently to, once again, expand broker margins. Hartford: Indeed, margins compressed cyclically throughout 2014 as underlying costs of capacity outpaced contractual rate increases in 2014, only to expand during 2015 and into 2016 as supply increasingly exceeded demand. In other words, the market and the models reacted as designed—brokers absorbed additional volume during 2014’s tightness and benefited from margin expansion as the market loosened in 2015. Armstrong: While annual contracts and rates still tend to dominate the shipper “sell” side of freight brokerage operations, the carrier “buy” side has become increasingly important and for many freight brokers. Spot market pricing on the carrier side is now driving the majority of the business, so having valid lane pricing benchmarks and carrier capacity data is critical. It’s the difference from being a 12% gross margin company and a 16% gross margin company. The large guys (C.H. Robinson, Hub, Coyote, TQL) tend to be very good at tracking lane pricing. Services such as Chainalytics, DAT and truckstop.com also help in determining market rates. On top of these, new entrants such as CargoChief have built some leading-edge processes in developing rate benchmarks. Hartford: This year’s environment appears similar to 2012 and 2013—periods that were marked by tepid U.S. GDP growth and a relatively balanced supply/demand environment within the TL space. The impact to brokers is one of choice—either attempt to preserve gross margins by sacrificing transaction volume as underlying spot rates remain relatively pressured, or be willing to compromise gross margins in an effort to continue to drive transaction volume growth. Armstrong: Prior to 2015, oil and gas was a bright spot; however, with lower oil prices the shine has come off. It has made a negative impact on 3PLs in business volumes and in decreased fuel surcharge revenues. We expect U.S. GDP to pick up this year and drive increased 3PL growth, but DTM growth will be closer to 7% to 9% versus the double-digit growth levels we saw in 2010 through 2014. Larkin: The current mediocre freight environment has supply and demand roughly in balance in the TL space. Balance is seldom desirable for brokers. Rather they prosper when markets are out of balance, when fright exceeds capacity or vice versa. LM: Emerging technologies and start-ups continue to pop up on the scene, coupled with the concept of the “Uberization” of the freight market. Where do these elements stand? Armstrong: Back in July 2016, we published a report on “Uber of Trucking” applications. What we found was of the 27 applications we studied, none had the identical functionally of the Uber ride-hailing app, and most had more functionality. So, we prefer to call companies that aim to match shipper demand with carrier supply/capacity via digital platforms Digital Freight Matching (DFM) companies. The numbers are compelling. Our estimate of the 2016 U.S. trucking market was $741.6 billion. Global investment in on-demand technologies soared to $18 billion in 2015—a record high. The DFM sector has attracted over $180 million in venture capital investment since 2011, including $67 million in 2016 alone. Motor carrier empty miles estimates range from 10% to 23%, while e-commerce fulfillment costs are increasing. The natural response is to improve inefficiencies in the trucking industry with an Uber-like solution. But one of the key components of Uber’s model is the commodity-like nature of the ride-hailing service. Our analysis shows the principle behind DFM may be simple, but the trucking industry isn’t. Domestic transportation is not a simple commodity. Complexities arise in the form of specialized equipment types, shipments transported via multiple modes, and necessary exception handling for service issues such as equipment breakdowns. Shipments are high-value and time sensitive, and placing an Uber-like app atop a complex industry doesn’t truly address the problem. Larkin: There is no question that the level of competitive intensity is ramping up. However, as Evan mentions,the new start ups are struggling to gain traction as these companies are typically tech-centric and have little feel for all of the nuances that exist in the freight markets. The Uberization of the space is actually taking place within the big 3PLs instead. C.H. Robinson’s Freightview is a good example of the type of Uberization that is being developed by the leaders in the industry. The Uberization has really taken hold in the LTL space, as many carriers are API compatible. As more and more truckload carriers adopt APIs, this process will accelerate on the truckload side of the industry as well. Hartford: On top of this I’ll add that logistics space is arguably evolving at the fastest pace in the industry’s relatively young lifespan. We believe incumbent brokers must adopt an “evolve-or-die” mentality, as the pace of technological change will not wait for the reactive to respond. However, proactive models—those that embrace technologies such as API and acknowledge the accelerating pace of change in the space—should be in a position to capitalize on incremental share gain opportunities presented by the development of new technologies. LM: How do you view the market from a regulatory perspective? ELD is now just a few months out; so, will the market benefit from the expected tightening of capacity? Larkin: We believe that the ELDs will have dramatic impact; provided that the Supreme Court doesn’t overturn the rule. Carriers, that tend to offset their cost disadvantages by driving more than the legal number of hours, will either become compliant or will simply drop out of the industry. Either way, capacity will drop. Hartford: I would add that the ultimate impact from the upcoming implementation of the ELD mandate remains highly uncertain and, therefore, a highly debated topic. Numerous important questions remain—primarily in the form of the number of trucks currently in violation of existing drivers’ HOS rules, the degree to which those trucks are running hours and miles above and beyond current regulations, and what will be the level of enforcement when the mandate becomes effective. However, it’s highly likely that 2018 will experience some degree of capacity tightness due to the mandate, and we believe a 2% to 4% reduction in industry capacity is the range with the highest degree of probability of being realized. In the short term, brokers are not likely to benefit from any tightening of capacity due to the ELD mandate, as per-unit gross profit margins are likely to be squeezed as spot market capacity initially tightens. Armstrong: Keep in mind that there’s capacity to spare right now, so if the ELD and ‘running legal’ takes out some capacity, DTMs will manage. What we find very interesting is the potential data, which can be garnered from ELDs, may be tapped by DTMs. It could provide a real-time solution allowing 3PLs to know where carrier capacity is and where drivers have hours. This could add efficiencies to the overall U.S. transportation market and DTM 3PL segment and make up for any lost capacity. Hartford: As tools that improve the visibility to the broader supply chain develop, we believe shippers will be presented with capabilities to reduce their per-unit transportation costs by improving inventory cycle times and participating in asset-sharing programs. 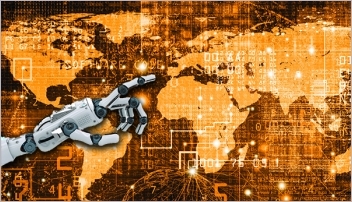 However, to fully benefit from new technologies, shippers will likely have to evolve from recent bid mentalities of seeing the lowest-cost solution through an annual bid cycle and toward one that involves partnering with brokers with scale and IT capabilities and improving their communication and collaboration with such brokers. Armstrong: I certainly agree with Ben. 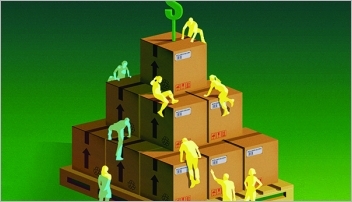 The trend is toward more strategic 3PL/customer relationships. Since we began tracking 3PL/customer trends in 2001, we’ve seen increases in 3PL use. On average, 3PLs provide 2.77 services per customer relationship, with the most common services including some combination of transportation management, warehouse management and value-added transportation management. We advocate working with 3PLs to continue to drive out costs and optimize supply chains; and this goes beyond leveraging the transportation spend of large freight brokers to looking for other ways a 3PL can help shipper operations from a cost and performance perspective. Armstrong: We see the DTM market continuing to streamline and automate operations, and there will be more with combined freight brokerage and managed transportation solutions that can meet the needs of small to large customers having varying degrees of supply chain complexity. Our estimate is that the U.S. DTM 3PL market segment will reach $96 billion in gross revenue by 2022. Larkin: Indeed, we project that the outsourcing market for 3PL services will grow faster than the freight market, while players within the industry will consolidate into larger, better financed, better systematized companies. Smaller companies will have to join a Landstar, a Sunteck/TTS, a Globaltranz or a Universal Logistics. Alternatively they will have to subscribe to the full suite of technology modules­—offered by a vendor like Truckstop.com—in order to survive and prosper. Hartford: Certainly the pace of change in the U.S. domestic transportation space is accelerating at its fastest pace since the early 1980s period of industry deregulation. In five years time, we believe API-based platforms that provide essentially real-time visibility across the supply chain to shippers will be ubiquitous. Such capabilities will become a required cost to compete in the space, resulting in attrition and consolidation among the brokerage community. It’s estimated that roughly 90% of truckload freight transactions are ‘planned’ as opposed to ‘spot,’ and we expect an increasing number of these transactions in five years will be automated and transacted at lower per-unit gross profit margins. We doubt fully autonomous trucks will be viable, but advances in semi-autonomous vehicles and hybrid autonomous applications should enhance a broker’s ‘network effect’ providing productivity improvements and resulting cost savings to shippers; further raising barriers to entry in the domestic space; and driving incentives among shippers to continue to outsource logistics functions to proven providers.